In my dreamscapes, I am home. I'm lulled to sleep by the rain. Hon, it's not about when the food runs out. It's about when enough people realize that it's going to. But this is the end of the world. God has ran out of miracles. The Islands At The End of the World is a truly remarkable debut novel. A powerful and harrowing tale of perseverance and the desperate search for safety and loved ones in a world rapidly falling apart. Leilani is half-Hawaiian. She lives with her parents and younger brother on the Big Island of Hawaii, struggling to belong and not feel like an outsider. She's epileptic, and at the beginning of the story she travels with her dad to Oahu to undergo medical testing for her illness. That's when odd things start happening, rendering Leilani and her dad cut off from the rest of their family and unable to return home. First, some unidentified celestial being in the shape of an orchid appears in the sky (only visible at night), then all the electronics stop working, meteor showers rain down on Earth, big waves rip into the land and the world starts tumbling down. No one knows what's causing it, no one knows how to stop it, how to fix it, how to get the situation under some sort of control. 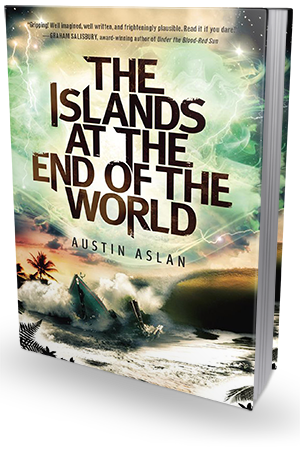 The Islands At The End of The World combines a blood-chilling, terrifyingly plausible apocalyptic scenario with richly imagined, beautifully rendered exotic world of the Hawaiian Islands. Austin Aslan does a marvelous job making the plot line appear painfully realistic and, therefore, completely breathtaking, weaving in some truly fascinating Hawaiian mythology, unique language and culture. The idea behind the story might not be entirely new, but it's certainly done well. Thanks to Aslan's captivating writing style and his extensive knowledge about Hawaii, its indigenous people, and their lives, this book really shines. As far as characters are concerned, both Leilani and her dad are very real and believable as characters. They seem very down to earth and unremarkable, but their strong bond and willingness to sacrifice for one another makes them relatable and worth carrying about. Leilani's dad was particularly interesting to follow, what with all the surprising ideas he had and his unique way of handling things. After all, it isn't often you come across a parent in the YA literature who would ask his epileptic daughter to trigger an epileptic seizure on purpose in order to get out of a military camp, or a father who'd casually smoke weed with his teenage kid. Yes, Leilani's dad was very different from what you'd usually see in YA novels. I definitely liked him. Leilani herself is a strong heroine. She never quite felt like she belong anywhere before, partly because of her origins, but also because of her sickness. And yet her love for Hawaii and it's culture is apparent and inspiring. Despite the way Hawaiian people treat her (as an outsider), she feels a strong connection with her Hawaiian heritage and is determined to nurse it. The Islands At The End of the World is not a very past-paced book, but it's certainly intense and compelling. It wasn't a one-afternoon kind of read for me, but I enjoyed every moment I spent in this gorgeously rendered, vivid world. Plus, this book really scared me. I'm seriously considering stocking up on iodide pills and building a nuclear bunker somewhere up in Alaska. Read it, if you dare. Evie, beautiful blog! Thanks for hosting me for a day on the ISLANDS blog tour! So glad you enjoyed the book. Sorry to scare you! ;) Best wishes for you in 2014 and 2015 and beyond!